Vin TOURAINE-MESLAND – Whether his dress is light or dark, what a character ! 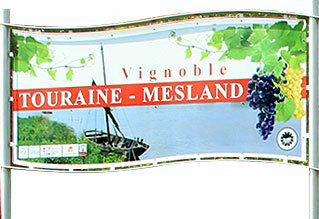 The TOURAINE-MESLAND is a wine produced around Mesland, in Loir-et-Cher. This is a geographical name within the Appellation d’Origine Contrôlée Touraine. It is produced in the order of 5000 hectoliters in the territory of the appellation which covers an area of about 105 hectares on the right bank of the Loire downstream of Blois on the department of Loir-et-Cher. The white wines come mainly from Chenin (Pineau de Loire). The red wines are blends of Gamay, often the majority, Cabernet franc (locally called Breton) and Côt (called Malbec in Bordeaux). These wines, often light, can sometimes in good years be kept 5 or 6 years. L'abus d'alcool est dangereux pour la santé, à consommer avec modération. Je certifie avoir plus de 18 ans pour visiter ce site.